The North Face Campforter Double 20 Sleeping Bag. Never again sacrifice snuggling for the sake of warmth or weight with this two-person sleeping bag featuring high-performance, responsibly sourced 700-fill ProDown™ insulation and an anti-compression Heatseeker™ Pro synthetic bottom layer for the utmost in backcountry comfort and lightweight packability through three seasons. 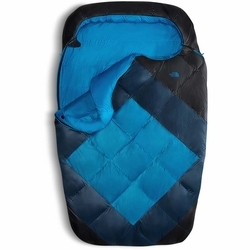 Wraparound zipper allows easy venting and converts sleeping bag into a quilt for fireside lounging.